Although not a fruit grown in my parent’s current back yard, it is one that I recall in the back garden of our Victorian single fronted home in Melbourne. The distinctive cultural contrast was evident through the homes facades and what was growing in the back. Whether it was a fig, olive, or nespole tree or a prickly pear cactus, I am certain we weren't the only Italian family in the street with these unusual fruits growing in our front or back yards. Who would think that this ugly, spiky fruit from an invasive succulent plant known by its scientific name as opuntia vulgaris mill or in Italian ficho d'india, would eventually be seen and sold at markets and in fruit shops today. Once considered a pest in Australia, it is now promoted for its antiviral and anti-inflammatory properties; treating diabetes, high cholesterol, obesity and even hangovers. It is said to be high in amino acids, fiber, B vitamin, magnesium , and iron. According to the Encyclopedia Britannica, the first recorded introduction of prickly pear was attributed to Governor Phillip at Port Jackson in 1788. The reason for its introduction to the new colony was to create a cochineal industry. A cochineal is an insect that feeds on certain species of cactus and from which a scarlet dye is obtained; at the time used to colour the distinctive red coats of the British soldiers. Many of these cacti plants are growing wild and seen bordering farm lands and countryside in rural Australia and many still feature in suburban backyards for their fruit. 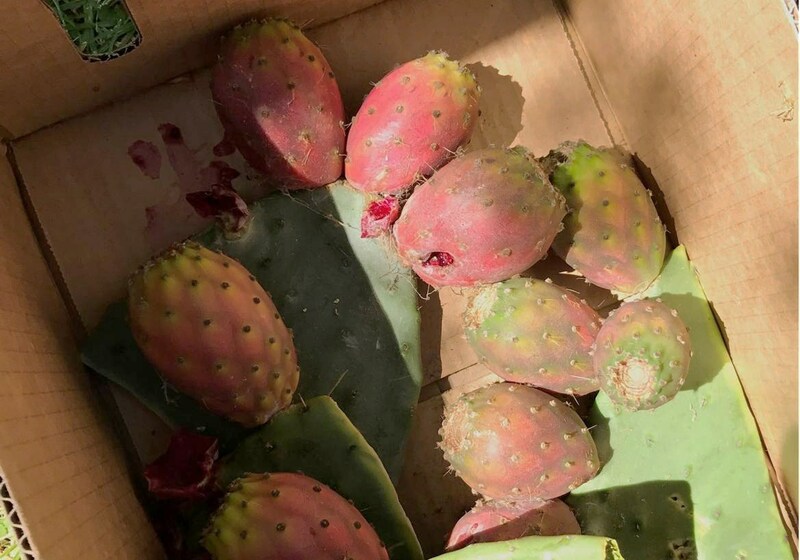 This small box of fichi d'india (prickly pears) were passed onto me by papa` from a friend who still grows them in his backyard. I have to confess though that I cannot recall the last time I ate one since a very young age and only ever eaten raw. It was also the only fruit growing in our garden that I was not allowed to pick, handle or peel on my own due to its finely barbed bristles and there are many stories of the trials and errors of peeling this fruit, and the pain that it inflicted. I was told that my husband’s father would undertake a very lengthy process of removing the spikes before presenting them to the family table which consisted of emptying the box on the grass and with a hard broom brushing off their spikes and hosing them down with water. Then with heavy duty garden gloves and tongs in hand he would inspect each one. Once at the table the art of peeling a prickly pear involved knife and fork. At no point in time would handling the fruit with your hands be allowed. The fate of these prickly pears was determined by my love of preserving the seasons harvest and so a jam recipe was kindly forwarded onto me by an Instagram friend Lana @mialanina. A liqueur recipe using this fruit was also suggested - one that I will surely try. 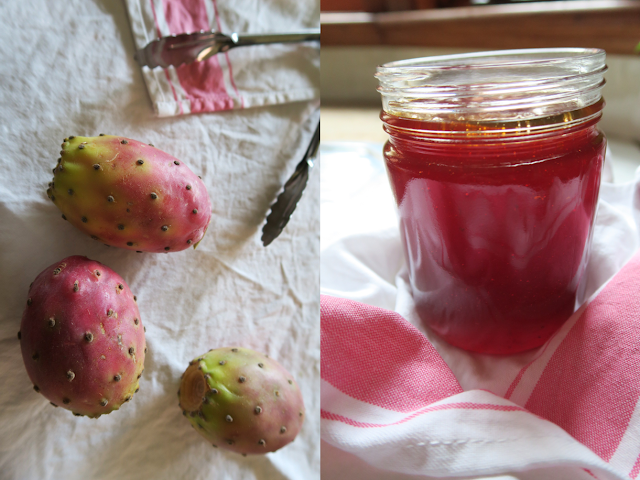 Varied recipe suggestions that came through from others included prickly pear paste, and ice-creams. I was also informed that in Sardegna it is turned into a jam and used as a filling for their renowned tilicas biscuits. This is a very simple recipe to follow and the quantity of fruit is purely dependent on how much you have available. When making jam, the fruit pulp to sugar ratio should be equal, so adjust your quantities accordingly. Cleaning the prickly pear according to this recipe requires immersing the whole fruit with skin on in water using tongs and allowing them to soak for an hour, changing the water a few times. This will soften the spikes and allow for easy cleaning. I still undertook the method of using knife and folk to remove the skin as seen below, which means that there is no handling of the fruit with bare hands. Once all the fruit is peeled, place in a heavy based saucepan and on a low heat with lid on cook until the fruit begins to break down, approximately 15 minutes. The next process is to separate the pulp from the seeds by passing fruit through a sieve pressing with the back of a spoon into a bowl. The pulp will appear runny similar to a smoothie. You could end the process here and drink it as is, enjoying its nutrients or continue on to make the jam. Weigh the pulp and transfer into the same saucepan. Weigh equal amounts of sugar to pulp and place the sugar in the saucepan along with pulp. Cook on low heat and stir occasionally until the setting point has been reached. Meanwhile grate the orange and lemon rind and add to the jam at the very end of the cooking process. I cooked the jam for a further 10 minutes in order for the citrus flavours to infuse into the jam.